MANILA, Philippines — Defending champion Ateneo de Manila High School pulled away in the second half for a 72-59 victory over Adamson University on Sunday, thus clinching a Final 4 bonus in the UAAP Season 81 juniors basketball tournament. 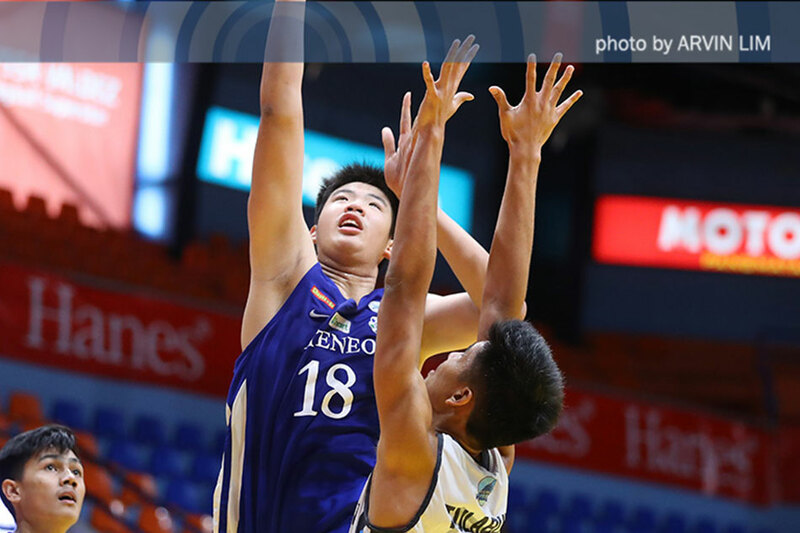 Ateneo’s twin towers went to work at the FilOil Flying V Centre in San Juan, with Geo Chiu tallying 18 points, 10 rebounds and four blocks, while Kai Sotto had 17 points, 15 boards, five assists, and two blocks. The Blue Eaglets surged to a 42-26 lead at the break, and never looked back. Joshua Barcelona had 14 points and eight rebounds off the bench while Jake Engbino chipped in 12 points, four boards and four assists for Adamson. The defending champions finished the season with an 11-3 win-loss record, good for second place behind National University (13-1). They will have a twice-to-beat advantage against No. 3 Far Eastern University (FEU)-Diliman (9-5) in the Final 4, which starts on Friday. The Blue Eaglets will carry a six-game winning streak to the semifinals. NU, meanwhile, will take on No. 4 Adamson. The Bullpups and the Blue Eaglets only need to beat their respective opponents once to set up a finals rematch. Gerry Abadiano had 20 points and four assists, while Terrence Fortea had 16 points as NU topped FEU-Diliman, 81-75, to sweep the second round of the tournament. RJ Abarrientos led FEU-Diliman with 23 points and seven assists while Royce Alforque added 14 markers, five boards and four assists. The Baby Falcons ended up tied with the Baby Tamaraws at 9-5 but lost twice to the Diliman-based squad in the eliminations to settle for fourth spot. Earlier, Mark Nonoy had 16 points, seven rebounds and seven assists in his final high school game as University of Santo Tomas rout De La Salle-Zobel, 85-64, to end its season with an even 7-7 record. Jesse Sullano shot 29 points in University of the East’s 80-76 conquest of UP Integrated School to finish in seventh place at 2-12.